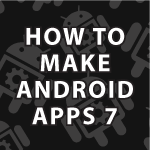 In this tutorial we’ll start making a useful Android unit conversion app. I’ll show you everything this time because I on purpose didn’t pre-plan anything. I’ll cover relative layouts, grid layouts, array resources, Array Adapters, Spinners, and more. In the next video I’ll finish the entire app. Like always all the code follows the video below. If it is still the month of July 2014, don’t forget to sign up to win a Samsung Galaxy Note 3 in my current contest. i have spent an exhaustive amount of time on line 50(54) id will not populate. if i type it manually the text color stays black and underlined red. Sorry, but I’m not sure which lines of code your are specifically talking about.